It has to be said: most bikes are only beautiful to cycling experts who know exactly what they’re looking at. For the rest of us, bikes look like utilitarian machines designed to get us from one place to another. The “Full Circle” urban bike design from Sanghyun Jeong and Jun-Tae Park is a little different: it’s beautiful, lightweight, foldable and simple to take with you just about anywhere. 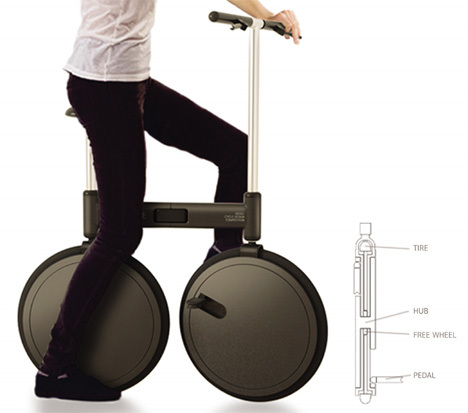 The chain-less bike looks a bit like an alien creature with two big eyes. Its large 20″ wheels are meant to make navigating through big cities easier, while the absence of a chain makes it lighter and cleaner than traditional bikes. Its ease of folding – and the way it can be simply rolled along behind one’s body when walking – make it the perfect urban bike to take along when part of your commute involves a train or bus. 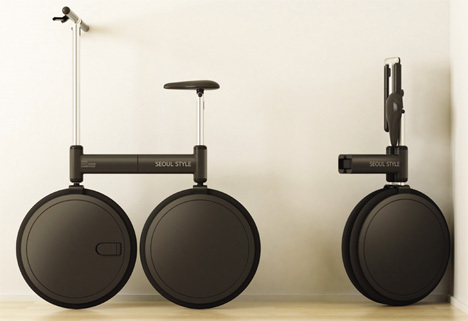 The Full Circle is one of the shortlisted entries in Designboom’s Seoul Cycle Design Competition 2010, chosen from more than 3000 entries. Its unusual shape and unfamiliar functionality may draw some critics, but this isn’t meant to be a mountain bike – it is a machine designed to roll easily through city streets and be carried into an office building. 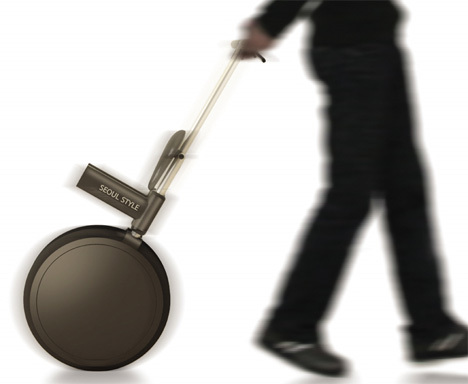 And for that purpose, this strange-looking grown-up version of a Big Wheel might be just what urban dwellers need. See more in Bikes & Cycles or under Transportation. September, 2010.